A Holocaust survivor reveals a decades-old memorial to the Jews of Iasi, Romania, just before a mass grave is uncovered. The Ghetto Fighters' House Museum (Beit Lohamei Haghetaot) recently received a historic gift – a hand-painted memorial to Jews of Iasi, Romania, who had been murdered by the Nazis. The memorial plaque, created by a 14-year-old artist in 1941, gained special significance due to the discovery late last week of a mass grave in a Romanian forest. The memorial was given to the museum last month as part of a campaign to collect Holocaust-era artifacts from survivors and their families. Survivor Yitzchak-Ephraim Benditer gave the museum the plaque, which he created as a teenager two weeks after the Iasi pogrom of June 1941, in which at least 13,000 Jews were murdered. 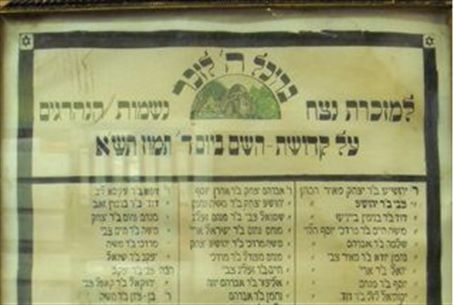 After the pogrom residents of Iasi asked Benditer, who was known for his skills as an artist, to create a plaque in memory of dozens of worshipers in the Great Synagogue of Iasi who had been murdered. The plaque was then hung on the synagogue wall. On Friday, researchers announced that a mass grave had been discovered in a Romanian forest, near the town of Popricani, which is close to the city of Iaci. The grave contains the bodies of approximately 100 Jews – men, women, and children – shot by Romanian troops in 1941. The revelation regarding the mass grave “gives this special significance... It could very well be that this plaque, with the names of the Jews murdered in Iasi, commemorates those whose bodies were found in the mass grave,” museum workers said. The mass grave shed light on Romanian involvement in the Holocaust, a sensitive subject in Romania, where for many years the government taught that Germans were solely responsible for murdering Jews. Historians have found evidence of several Romanian pogroms in which Jews and Roma were murdered. In 2004, then-Romanian President Ion Iliescu asked an international panel to investigate the Holocaust in Romania. The panel found that at least 280,000 Jews and 11,000 Roma were murdered in Romania and territories it controlled during World War II. Prior to the Holocaust, Romania was home to an estimated 750,000 Jews. Its Jewish population today is estimated at less than 10,000.